Student housing often plumb the depths of mediocrity, with simple units stacked on top of each other in the cheapest way possible and left to themselves without support programs. The Moholt 50|50 project is a reaction to this. 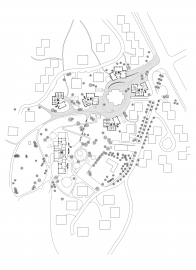 By injecting new collective oriented housing units, support services for students and public programs into an existing student village built in the sixties, a new active central area is created, erasing the psychological border between the student village and the surrounding area. 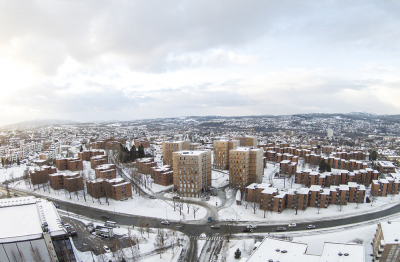 The project is located in Trondheim, Norway. The title Moholt 50|50 represents a turning point in the history of the student village. 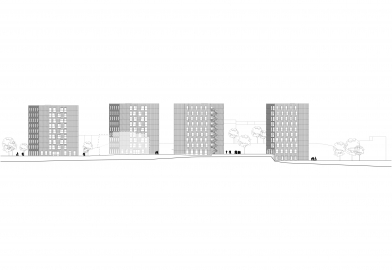 50 years after the inauguration of the first student units at Moholt student village a competition for young architects was arranged looking for a vision for the coming 50 years. True to the ideals of the student organization – offering both private space for individual needs and collective space promoting collaboration, social responsibility and tolerance, the winning project proposed tower constructions where every floor is a student collective. 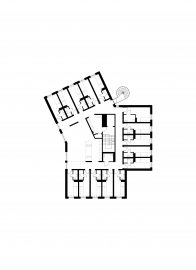 Every collective consists of 15 units with individual bathrooms. The habitants of the units share a kitchen, dining/ living room, entrance hall and a guest toilet. The ground floors of all towers offer spaces for more publicly oriented services of the student organization and commercial spaces. 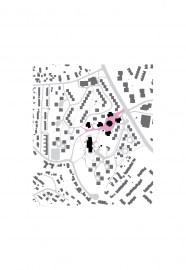 In addition to the student housing towers the masterplan consists of a kindergarten and a library with spaces for student activities. 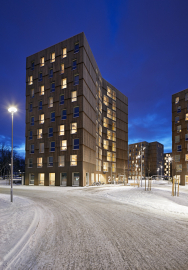 All buildings are constructed in crosslaminated timber (CLT) and have an ambitious energy concept. 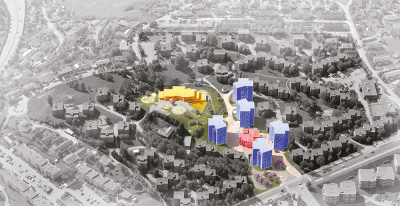 Moholt 50|50 is the largest CLT project in Europe. 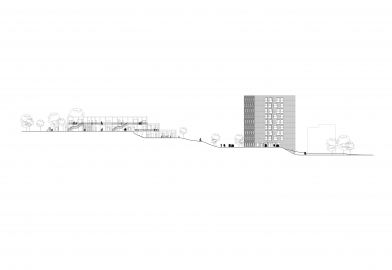 The guiding idea was to lay out a “street” through the student village, a coherent and active public space. Moholt allmenningen (Moholt commons), as it is now officially called, brings together existing small paths and roads to a larger public space and connects them to the larger road system. All new buildings are connected to this street which brings together movement and activity connected to the buildings. The Moholt Commons is a "shared space" area, also available to emergency vehicles, deliveries and handicap vehicles. It is designed as a public space with benches, stages, bicycle parking and planting - a place where people can meet. 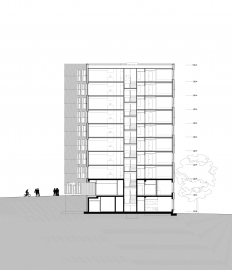 In the original competition proposal the towers were planned with conventional construction methods; a steel and concrete structure with a brick cladding, the latter in order to harmonize with the existing low-rise student housing with redbrick facades. To meet the project's energy and climate goals the project team researched the possibility of turning the structures into CLT constructions. The towers, with their relatively short spans and Y-shape volumes, were statically optimal for CLT-construction. The choice of CLT in load-bearing structures, the reduced energy need in accordance with the "passive house standard" and geothermal heating are the main elements of the environmental concept for the project. The local heating plant consists of 23 geothermal wells, heat recovery from ventilation air, heat recovery from waste-water, and solar thermal collectors, all of which provide for an integrated energy system. 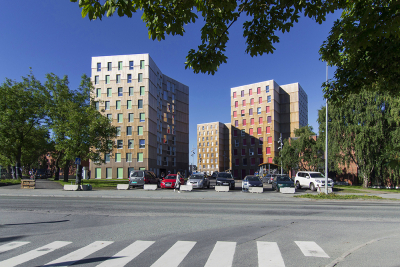 The use of CLT has reduced the CO2 in building materials by 57 % and the CO2 emissions associated with energy use are reduced by approximately 70% compared to standard Norwegian requirements. The five towers are 9-storeys high with a height of 28-metres. The basement and ground floor levels are made in cast reinforced concrete. 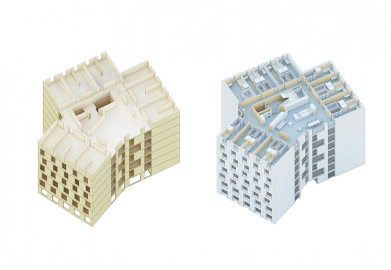 From the first floor to the 9th floor the structure consists of prefabricated CLT-elements. 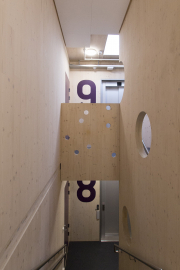 The approach to building with CLT was to take advantage of the finished surface of the CLT elements and expose as much as possible of the wood in the interiors. By utilizing the technical and aesthetic qualities of the CLT system a robust and honest expression was achieved. A full scale fire test was conducted to establish a better information basis for fire sizing, burn rate and sprinkler capacity. Like regular wood structures, CLT wood structures have the characteristics of shrinkage in tangential and radial direction. 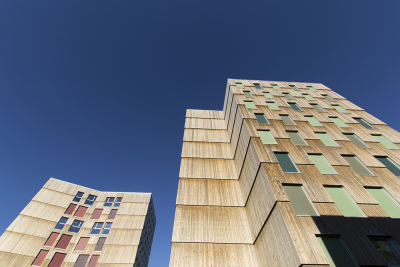 The façade cladding system of the student towers is designed to give it a telescopic characteristic, which can absorb the shrinkage of the floor elements without creating tensions in the cladding. The façades are clad with Kebony treated pine wood panels. The cladding on the ground floor is treated with a fire protecting wood stain, whereas the rest of the Kebony façade is left untreated and will weather naturally.